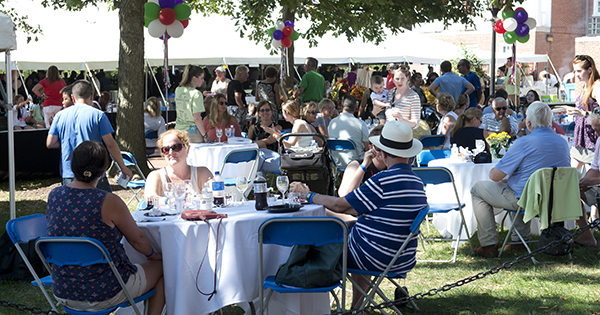 The Taste of Newark food festival, an event that brings together the University of Delaware and the city of Newark to celebrate the town’s restaurant and beverage distributors, recently marked its 14th year. The event is the result of collaboration between the city, the Downtown Newark Partnership, UD’s Department of Hospitality Business Management and UD Conferences and Events Services. Hospitality students also participate in Taste of Newark, helping to plan and manage the event, setting up and taking down booths at the end of the day, while also helping restaurants make sure everything runs smoothly. For senior hospitality majors Eliana Damiani and Jamie Montgomery, their participation in the event counted toward the 100 community service hours that hospitality students are required to complete by graduation. Damiani and Montgomery said that they love being able to interact with the restaurants and believe the experience will help them in their future careers. Hospitality business management students at UD receive scholarships through the support of the event, and funds from the event also benefit the beautification of Newark through the Downtown Newark Partnership and the Newark Arts Alliance. Guests at this year’s festival enjoyed a variety of sample dishes from more than 40 restaurants, breweries and wine and spirit vendors. The Courtyard by Marriott Newark at UD served its famous jumbo lump mini crab cakes along with blackened shrimp with cheddar and bacon grits. UD’s UDairy Creamery did not disappoint with unique ice cream flavors. At this year’s Taste of Newark, the Creamery served honey apple cake, shoofly pie and Delaware River mudpie ice creams. Main Street staple Deer Park Tavern served pork and chicken tacos with lime cilantro sauce and pico de gallo this year, as Catherine Rooney’s Irish Pub and Restaurant served the Irish classic Shepherd’s pie, along with pulled pork sandwiches and bread pudding. Not only were guests able to sample delicious dishes from across town, they also enjoyed live music and a silent auction, with proceeds from the silent auction benefiting the Newark Arts Alliance. Guests also enjoyed a live cooking demonstration from Ronnie Burkle, a chef with SoDel Concepts. Burkle demonstrated how to prepare homemade farm cheese with cracked pepper and honey, a grilled corn and peach salad and a chocolate orange pot de crème for dessert. Burkle was joined by Michelle Souza, who paired the recipes with wines from Southern Wine and Spirits. This is Burkle’s fourth year participating in Taste of Newark, and he said that he loves to connect northern Delaware to southern Delaware, where all 12 of the SoDel Concept restaurants are located. Sheryl Kline, chairperson of UD’s Department of Hospitality Business Management, reiterated the importance that the Taste of Newark has on the entire community. Kline said she enjoys that the Taste of Newark gives students firsthand experience working in the industry while also supporting local restaurants. “We believe that we should help our communities in which we have our businesses,” Kline said.